The results from the survey reveal a number of notable findings that provide insights into the current attitudes, challenges, and perceptions of African security sector professionals and how these are evolving. An initial striking observation from the survey data is that younger recruits are joining the security services with more advanced education levels. Just 26 percent of respondents in the youngest cohort, for example, entered service with a high school diploma as their highest level of educational attainment. This compares to 47 percent among those in the oldest cohort, reflecting a major shift in academic capabilities within the services in recent decades. Among young recruits, 41 percent entered service with a bachelor’s degree. 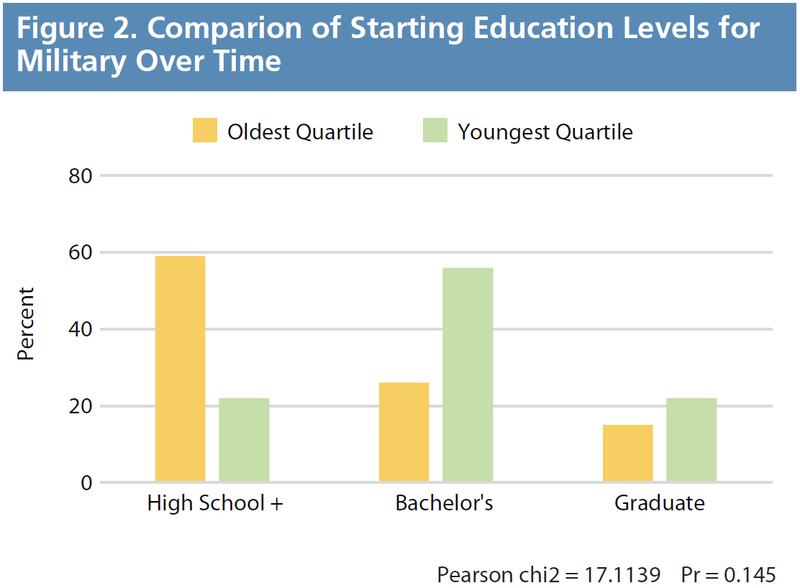 By contrast, only 30 percent of the oldest cohort had attained a bachelor’s degree when they began their careers. Differences in education level also emerged between services. 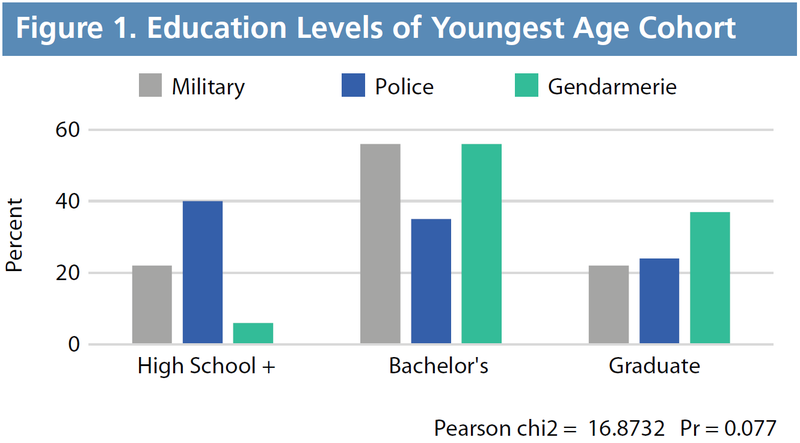 Recruits from the youngest cohort who joined the gendarmerie and military started their service with relatively higher education levels than the police (see Figure 1). Specifically, 56 percent of recruits from the gendarmerie and military had a bachelor’s degree versus 35 percent for the police. This divergence is particularly noteworthy for the military, as it shows a dramatic improvement in the education levels of earlier age cohorts. There were just 26 percent of bachelor’s degree holders among military recruits in the oldest age cohort. Consequently, over a several-decade period, the percentage of military recruits with bachelor’s degrees increased by 30 percentage points. Likewise, the percentage of those in the youngest cohort joining the military with a high school diploma (22 percent) is roughly a third of the 59-percent figure for the oldest age cohort (see Figure 2). By contrast, starting education levels for the police have not shown such improvement. Rather, the percentage of those starting service with a bachelor’s degree remained consistent at 32–35 percent across the cohorts. The emerging generation of African security sector professionals also tend to join the security services at an older age. 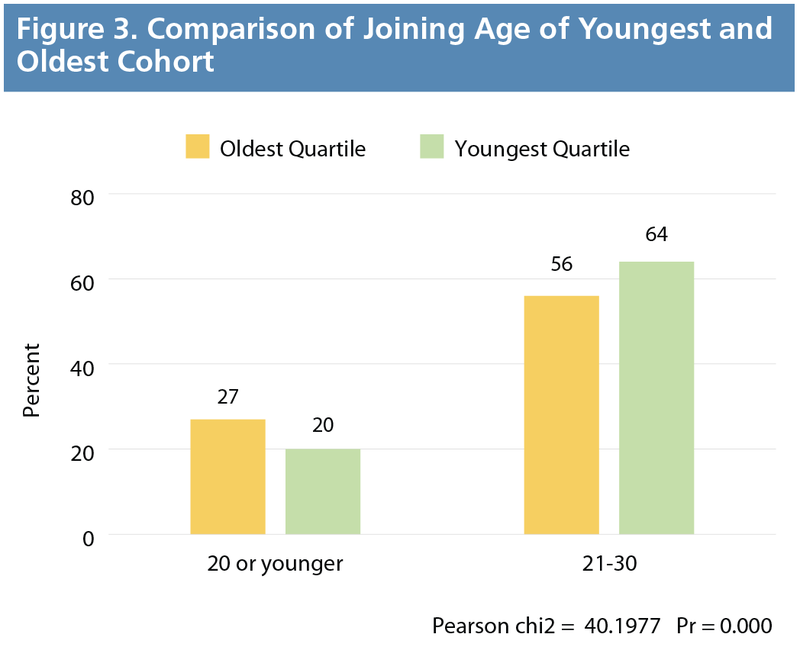 While nearly 28 percent of the older cohorts of respondents had joined the service by the time they were 20 years old, that rate has dropped to 20 percent among the youngest cohort (see Figure 3). Inversely, 65 percent of the youngest cohort of security sector professionals joined their respective service during their twenties. This is an increase of 10 percentage points from the oldest cohort. Those in the gendarmerie and police have tended to join at an older age than the military. Approximately 78 percent of the gendarmerie and 53 percent of police joined while in the 21–30 age range. This compares to 35 percent of those in the military. All of the comparative results highlighted in this Analysis section are statistically significant in Pearson chi-squared tests of the categorical variables, typically at or above a 90 percent confidence interval. Specific significance results are reported with each figure.